One of the things that I have loved for as long as I can remember is medical TV series. I used to watch Quincy as a kid; I love ER, have watched it since the first season and look forward to days off from work so I can watch the reruns on TNT. I love Grey's, Private Practice...you get the picture! Well, one of my latest favorite medical series is called Hopkins. The show comes on at 10pm on Thursday nights, right after Grey's reruns. I love this show because unlike my other faves, it's based on real life doctors and real life people. Last night, this show made me sob! A little girl was bought in, she was found in a swimming pool (she had attended a swimming party earlier that day). The camera shows this little girl's entire family at the hospital, including her PREGNANT mother just grasping at any straw of hope. When they were told that there was irreversible brain damage and that she was pretty much brain dead, just watching the reactions just broke my heart and made me cry. My heart went out to the whole family, especially the mom. I mean, she is about to bring a life into the world and at the same time she's losing one. The family eventually opted to have life support turned off...I couldn't begin to imagine what that loss feels like. It really touched home with me because less than 2 weeks ago, I had a pool incident with Donovan. He went past the 3 feet mark in a pool and was struggling to stand up, the water was up past his mouth. He was pulled out before he swallowed too much water and all I could do was thank God. After seeing this show, I went and laid in the bed next to him and watched him breath and counted my blessings. I then went and stood next to Xander's crib and did the same thing. I took a while for me to get myself together and eventually I fell off to sleep. AC Moore has started a new forum for all crafters! 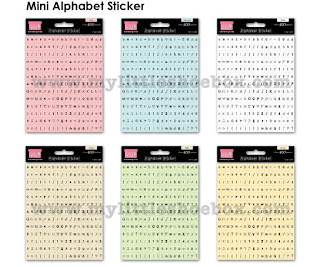 Click here to sign up- you will also be entered into a drawing to win a Cricut Expressions Bundle! 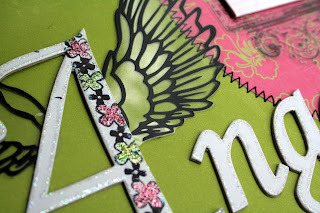 I can't tell you how much I loooove this die-cut glitter thermography paper by K&Co! There's so much texture with the embossed glitter design and decorative border...and it was perfect for this series of photos of my niece Jasmine and Xander. journaling: At 12 years old and just minutes older than her twin brother, Jasmine is my mom's eldest grandchild. Xander is 3 months old and is the youngest...for now. 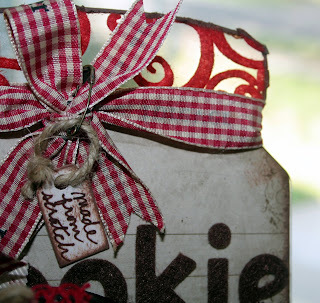 Don'tcha just love that thick polka dot ribbon? I found it at Michael's a while ago and have used it on a couple of projects- it just goes with everything! 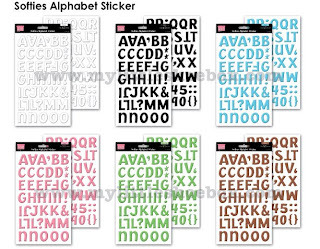 Now you know it's pretty hard to find a project of mine that doesn't have stickles on it! LOL! 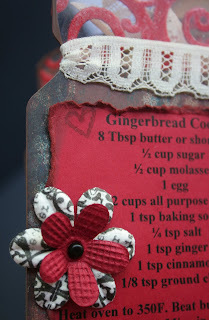 I made this mini using the Fancy Bracket chipboard book from Magistical Memories and Basic Grey's Euphoria line. This mini comes with 4 chipboard pages; I made 2 peek-a-boo pages by tracing the 2nd and 3rd pages onto a transparency and adhering KI Memories flutter white frosty lace cardstock to it. I also traced each page onto 2 different pieces of patterned paper and adhered them back to back for stability- this way I'll have plenty of pages to shout out the girls! I'm teaching this at my LSS in August. Get The Acrylic Jar Album! 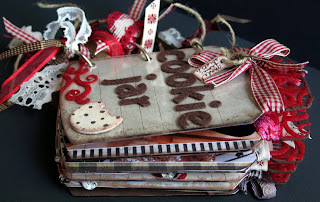 I've had a lot of scrappers ask me where to get the jar album from the previous post. The album is made by myacrylicalbum.com and can be purchased here. Have fun!!! And it's filled with goodies! This is my latest DT project from My Acrylic Album. I must admit, when I first received this jar album, I had no idea which direction I was going to take it in. 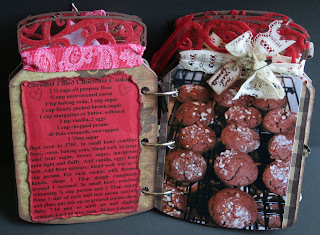 I peeked at a couple projects from fellow DT members and thought "how stinkin' cute, why didn't I think of that?" and then finally an idea hit me like a ton of bricks. I designed this album to look like the mason jars that I've seen filled with all of the ingredients needed to make baked goodies. ..you've seen those before, right? Really clever and they make great gifts! 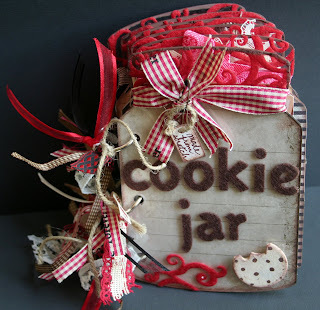 Anyway, I used Queen & Co self adhesive felt flourishes on the lid of the album to look like this cookie jar we had when I was a kid- I had forgotten all about it until now! 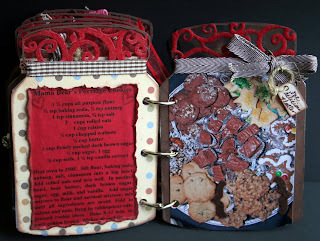 The album is filled with photos and the recipes of some of the cookies that I bake for our family every Christmas. You can purchase this album or any one of the fantastic acrylic albums here! All of the cream colored lace and the sheer ribbons were provided by savvynsassy. 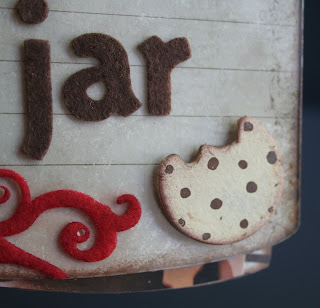 I created this cookie using one of those chipboard circles by Bazzill. I cut it with shaped scissors to create the "bite mark", sanded it, painted it, inked it, and then added "chocolate chips" with brown acrylic paint. 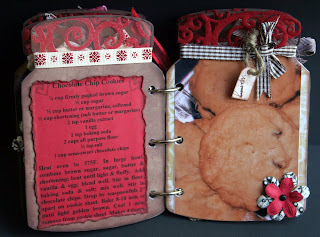 I printed each recipe on red cardstock, tore and inked the edges before adhering to the album. 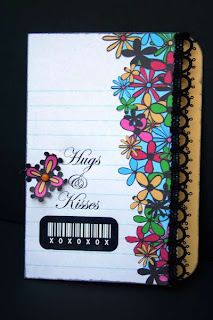 The stamped hearts are from Penguin Pants and were also included in this DT shipment- they were so fun to work with! Check 'em out here. In other news, check this out!!! 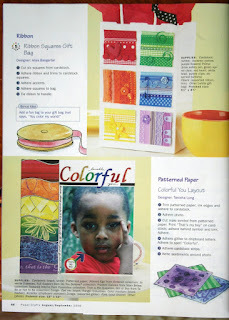 I have a LO (Lovable Colorful You) in this issue of Paper Crafts (Aug/Sept)- I am so excited!!! This was a LO that I created for Zsiage's DT. Dream Girls Challenge #8 is up and it's all about L-O-V-E! "There are all kinds of love - between spouses and partners, parents and children, your pets, even yourself. We want to see you create a layout that documents a love relationship in your life. The twists? Well, love and flowers go hand in hand. So you must add some flowers. The final twist is to use some form of distressing - ink it, tear it, sand it, paint it! We can't wait to see what you come up with." 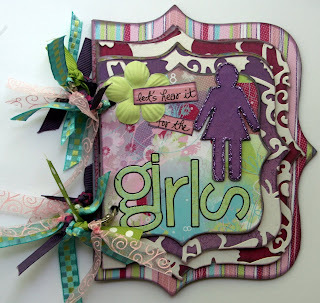 If you need a little inspiration, click here to see what the Dream Girls came up with! Here's my interpretation of the challenge. I had my niece take some pics of the boys and me- I love how they turned out! I used these Dream Street papers that I've been dying to use for a while. I cut the birds from the paper and shortened one of them so instead of love birds, they look more like mommy bird and baby bird! 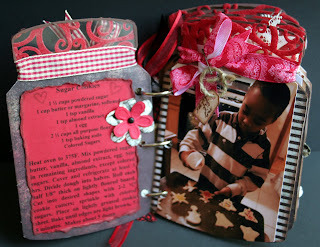 The journaling/title reads: mommy, the first girl they'll ever love. 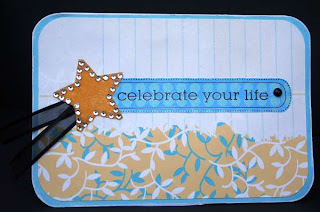 I started to add more journaling, but I thought that simple statement says it all! 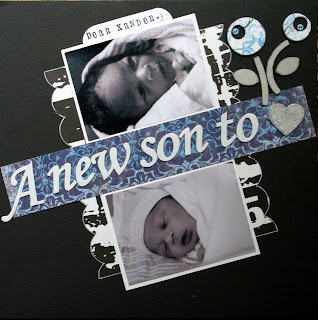 I distressed the edge of the entire LO, tore and inked the edge of the photo mat, and sanded the edges of the photos. 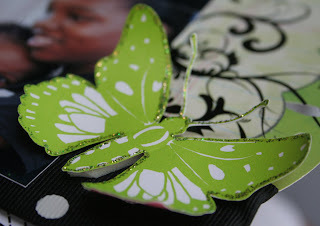 All of the beautiful ribbon/trim on the LO and cards was provided by savvynsassy! 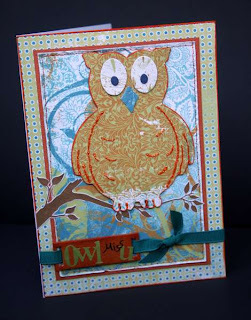 Owl Miss U Card- the owl is chipboard that I covered with this "too perfect for words" Kaiser paper. 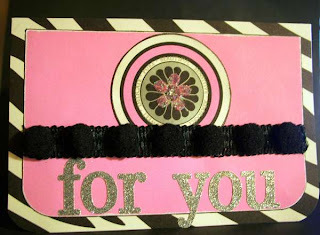 For You- Made with papers by Glitz Design - couldn't get a good pic of this to save my life! LOL! I took on the responsibility of taking care of my sister's 3 kids (plus my 2) while she went away on vacation and I nearly went bonkers! Seven people in my tiny house!! They were with me from Thursday night until Tuesday night) I had 2- 12 year olds (twins), 2- 4 year olds, and a 3 month old...I have never heard so much bickering in my life!! My son and my nephew bickered like mad and then they're the best of friends and the twins (boy and girl) bickered like an old, slightly unhappily married couple! And they can eat! My goodness- now I know why my sister is always going grocery shopping! I had her cracking up on the phone one night! I cooked dinner for 6 of us and told her my arm was hurting from stirring 2 boxes of mac n cheese! I didn't realize how much food it took to feed 6 people! I made breakfast Sunday morning and actually had to cook a whole pack of turkey bacon! That usually lasts my family for at least 2 feedings! How do people do it these days with the price of groceries skyrocketing?! Trying to entertain them had me tired and borderline delirious! Saturday we went to my goddaughter's bowling party and then to the pool at her house- Donovan almost drowned (in front of 2 life guards mind you) because he managed to drift just a little past the 3 foot mark and couldn't stand up all the way and had started swallowing water (my whole world just blanked out in that instance), my younger nephew who could barely stand up in 3 feet of water somehow got past me and was about to try to slide in the pool in 7 feet of water- thank God that didn't happen, that water was twice as deep as he is tall! This is after having him repeat to me and my friend over and over not to go past the number 3. Sunday we went to the movies- how can anyone afford to pay for a movie for a family of 5 people is beyond me...and we took our own snacks, except the popcorn which I purchased!? It cost about $50 just for an afternoon at the movies! After the movie and to help them burn off some more energy, I let the 3 boys have a water fight on the front yard with the hose and 2 supersoakers! Of course that caused more arguing, crying and whining between Donovan and Jaden because they both wanted the hose, so I made them share and my older nephew played with both supersoakers! UGH! My niece wanted no part of it so she sat in the house with Xander! It was a mess, but I have some great pictures- I'll post a few later! Monday, I sent Donovan to pre-school, I kept the the baby upstairs with me until the afternoon, my niece and nephews are downstairs ruling the TV so I could try to regroup so I'd have enough energy to continue going on! 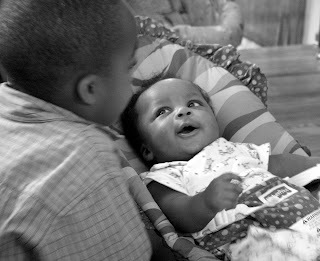 I tell you, I give props to any woman with kids, especially if they have more than 2! Tuesday, my sister returned from her vacation- so that became clean-up day in my house! I had my older nephew clean the bathroom, which was a mess from 5 kids and take out the garbage, Donovan, my younger nephew, and I all whipped Donovan's room back into shape and my niece cleaned the kitchen and vacuumed the living room. I then went behind them and swept and mopped the floors and did a couple loads of laundry! I sent Troy to pick-up my sister from the airport and was just starting dinner as she walked in looking all relaxed from a nice vacation....but that didn't last long because she ended up having to go off because the kids couldn't find her car keys! I sent them out earlier that day to pack up the car with their luggage and never thought to ask for the keys back. We searched and searched and she finally eneded up finding them in a flap in the stow away seats INSIDE the car! Thank goodness her car doesn't automatically lock after a few minutes or she would have been S-O-L-! Anyway, the chaos has died down and my house is back to normal, except for the fact that Donovan has had a fever for 2 days! Calgon...take me away! Can you say birth control!? LOL! 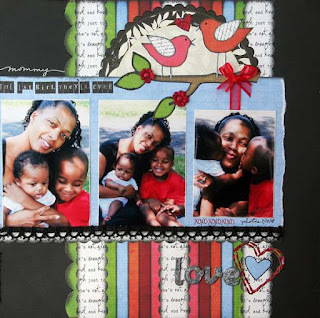 Check out this versatile, one-of-a-kind puzzle album by My Acrylic Album! 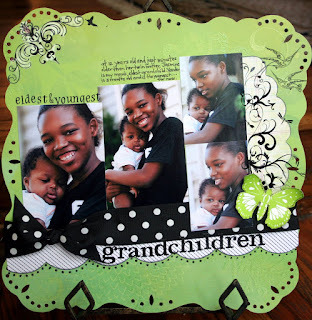 It comes with 4 interlocking puzzle pieces that can be used as an album or pieced together as a home decor item! The best part of purchasing this abum is that portions of each and every "Mason's Puzzle" sold will be sent directly to AutismSpeaks.org to further their research in finding a cure for Autism! how awesome is that?! I chose to create a home decor plaque with my puzze to honor the 3 guys I love most in this world! I used a ton of different rub-ons and chipboard and alpha stickers. Love this trim- I bought enough to use on a few projects! Um, yeah- I covered everything with stickles! Here's another group of product premiering at CHA that I can't wait to work with! 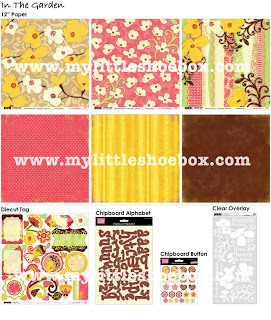 I mean just look at these sneak peeks from My Little Shoebox- aren't the colors just divine? 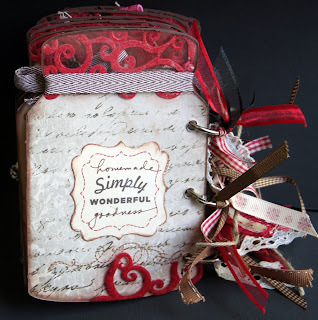 I am loving every single bit of scrap goodness here! (drool, drool) Lucky me, I get to design with 2 of the lines seen here! I'm stalking the mailman as we speak and can't wait to see these in person...and touch them...and smell them...OK TMI!!! I need to find some photos worthy of these designs! 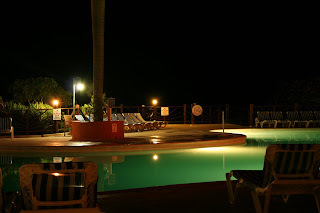 Check out the blog and and let them know how much you like what you see!! 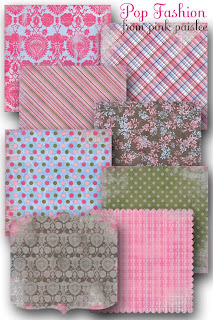 I can not tell you how much I'm looking forward to Pink Paislee's new CHA releases. 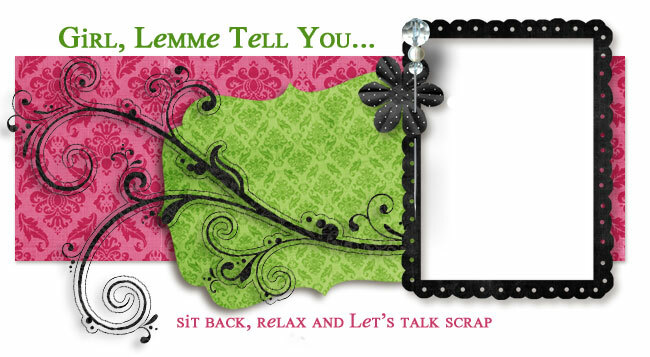 I can't say that I've ever been this excited by new scrap product, but Pink Paislee has lit the fire in me!!!! 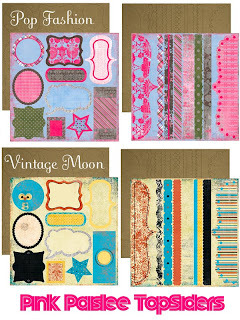 I mean just look at these colors, I just wanna reach out and touch them and I absolutely have to have Vintage Moon!!!!! I am so excited about Pink Paislee that I'm going to BEG the LSS owners where I teach to order some- I don't care what else they order, I need Pink Paislee!!!! I haven't scrapped in a few days- I need some inspiration (and some new pictures to scrap), so I turned to "ole faithful", pagemaps.com because Becky always comes through with some inspirational sketches. Well during this visit I found that pagemaps has kicked off a blog today and there's a sketch contest too boot! So here's the LO I created using her sketch!! One year ago, today...I was married, the mother of one rambunctious 3 year old little boy and our family of 3 were on our way to enjoy the family vacation of our lifetime, along with grandma, pop-pop, and a few other family members. 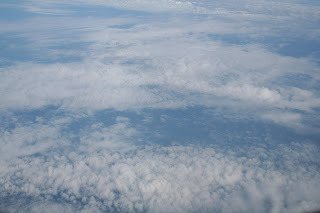 One year ago today, my camera was geared up to take photos like this one taken from the airplane on our way to Jamaica. 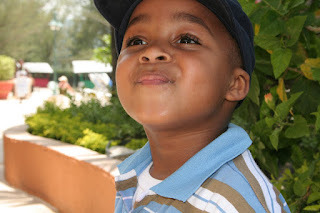 And this one...the look on the face of my little boy after trying his first virgin strawberry margarita! 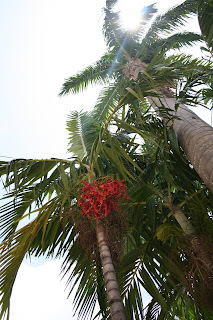 And the tall palm trees that we don't get to see unless we're on vacation. This year, I am still married, the mother of a rambunctious 4 year old AND an adorable 2 1/2 month old. We are a family of 4 and money's a little tight with me being on maternity leave so there are no tropical vacations in our near future. 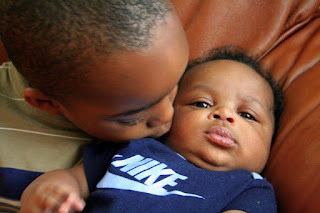 and photos of a big brother who can't stop showing his little brother how much he loves him by kissing him as much as humanly possible! Although, I could reeeeally use a vacation right about now, I wouldn't change a thing! You can catch it, too! 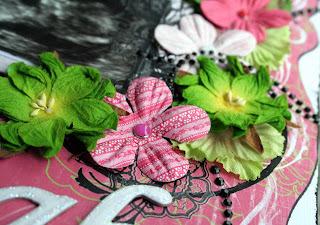 Come on over to serendipityscrapbooks.com for the Blog Party!! 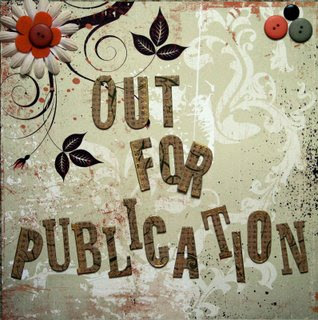 I've been invited to join the design team over at savvy n sassy! I'm excited to get new ribbon to work with every month! 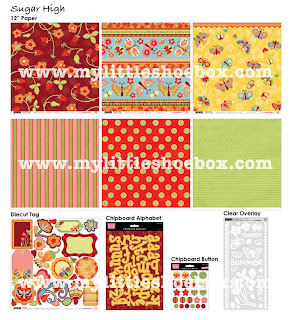 Check out the ribbon kits for July! Thanks Helena! I am so thrilled to have received this; it means the presenter thinks your blog is outstanding because of your designs, actuality, and themes. Now I can pick 7 others too to give the award! 1. Winner can place the logo as shown up in this message. 2. Place the link to the blog from whom you got the award. 3. Send the award at least to 7 others who are outstanding in their blog too. 4. Put the links of the blogs on your own blog. 5. Leave a message on the blog of those who have won the award too. These are the people I would like to give the award! 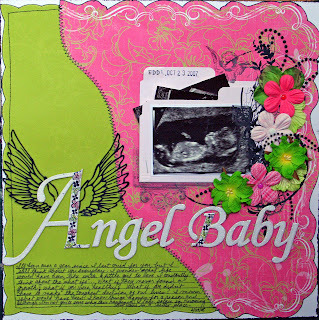 Check out their blogs, these are some amazing artists;very talented scrapbookers, card makers, and photographers! 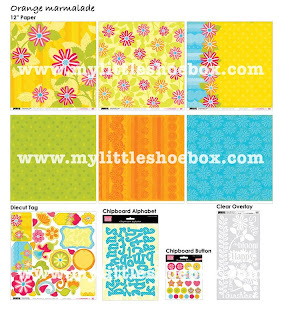 Stop by My Little Shoebox's blog and meet the new DT! This LO was scrap therapy for me. 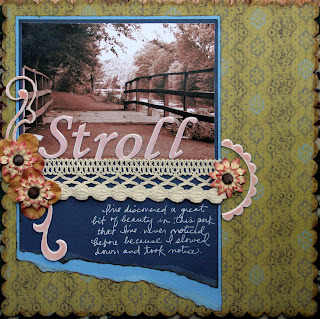 I created it for challenge #7 at the Dream Girls Challenge Blog- this week's challenge is to create a LO with raw journaling. 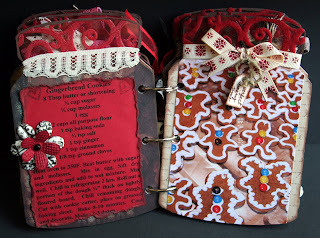 The twists were to use a household item for stamping and to use office supplies. I painted the lip of a plastic cup and used it to stamp circles on the righthand side. My office supplies were staples and a date stamp. 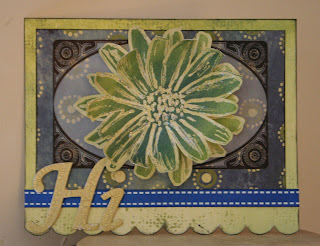 I stampes this flower border of Zsiage's chipboard alpha and filled the outlines in with stickles. Another My Little Shoebox project!